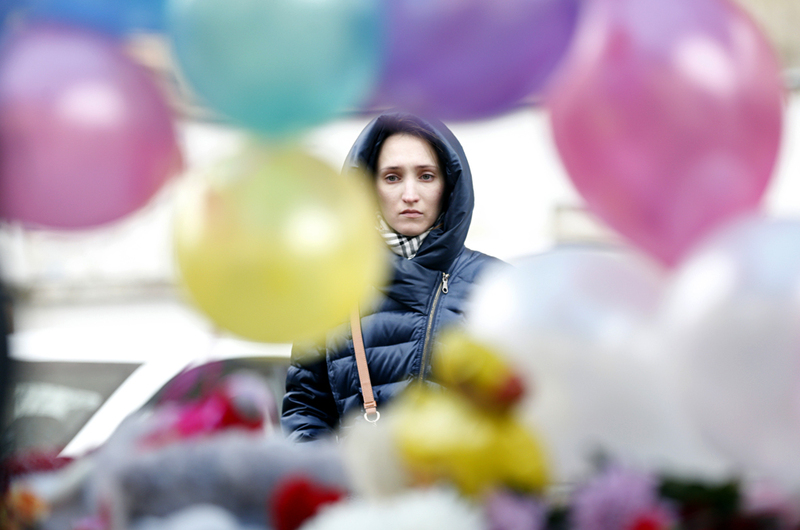 A woman grieves in front of the site near the Oktyabrskoye Pole underground station in Moscow, March 1, 2016, where a woman carrying a severed child's head was arrested. Moscow's Presnensky District Court has sanctioned the arrest of Gulchehra Boboqulova, a woman coming from Uzbekistan and suspected of committing the high-profile murder of a young girl in her care in the northwestern part of Moscow. "The court rules to take Gulchehra Boboqulova into custody for two months as a restrictive measure," Judge Tatyana Vasyuchenko said in announcing her decision on March 2. The investigation said in presenting its initial findings to the court that the child had been murdered not later than 9:30 a.m. on February 29, after which the suspect severed the girl's head and brought it to the entrance to the Oktyabrskoye Pole subway station, where she was detained. The suspect did not speak much at the court hearing but only gave consent to her arrest and told the court some information about herself. In particular, Boboqulova said she was born in 1977, had no criminal background, had a secondary education, and was the mother of three sons aged 20, 19, and 16. The suspect answered only one question from journalists before the hearing, saying that "Allah told" her to kill the girl. The investigator said at the court that the suspect had not been indicted within the first 48 hours, as the process required more time to determine all counts of which she would be accused. An official from the Investigative Committee department for Moscow said at the court that the investigation had yet to identify the suspect's accomplices who incited her to commit the crime and who are still at large. "The suspect's accomplices, namely instigators, are at large at the moment," the investigator said. The investigation plans to formally indict Boboqulova on March 4, he said. The woman has been taken into custody at least until April 29, 2016. A source with knowledge of some information related to the case told Interfax that Uzbek law enforcement agencies had informed their Russian counterparts that Boboqulova had suffered from schizophrenia and repeatedly undergone inpatient treatment in Uzbekistan. Having undergone one of such treatment courses about five years ago, Boboqulova went to Russia, where she apparently concealed her mental disorder, the source said.